Goldman Sachs beat analysts expectations despite what its CEO described as deteriorating market conditions. NEW YORK (CNNMoney) -- Goldman Sachs may have beat earnings and revenue forecasts when it reported second-quarter results Tuesday, but an overall slowdown in investment banking activity took a toll on its bottom line. "During the second quarter, market conditions deteriorated and activity levels for both corporate and investing clients were lower given continued instability in Europe and concerns about global growth," said CEO Lloyd Blankfein in a statement. Goldman Sachs' (GS, Fortune 500) net income slipped 11% to $962 million, or $1.78 a share, and revenue fell 9% to $6.63 billion. (See correction below) Analysts surveyed by Thomson Reuters had expected earnings per share of $1.16 and revenue of $6.3 billion. Alongside a sharp drop in revenue, Goldman Sachs managed to maintain its profit margins by slashing expenses. The bank cut overall expenses by 23% to $5.2 billion from a year earlier. Chief Financial Officer Dave Viniar said the bank expects to trim an additional $500 million by year's end, with the majority of the reduction coming from cutting back on compensation by hiring "more junior" and lower paid staff. 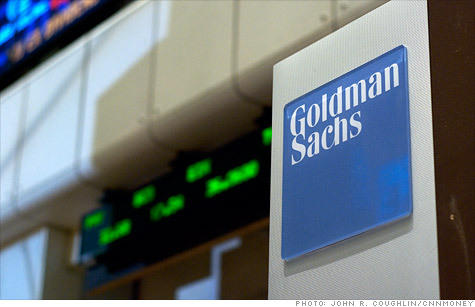 Goldman Sachs cut salary and bonuses to $2.92 billion during the quarter from a year earlier. At the end of the quarter, the firm had 32,300 employees, down from 35,500 in the prior year. The average compensation per employee for the first half of 2012 fell to $226,000 from $237,000 during the first six months of 2011. Like JPMorgan and Citgroup, Goldman Sachs reported a sharp decrease in investment banking revenue, which dropped 17% to $1.2 billion from a year earlier, though it increased 4% from the first quarter of 2012. But Viniar was optimistic that M&A activity could pick up in the third quarter as the bank "continues to see a very large number of discussions" of possible takeovers. The overall slowdown in initial public offerings in the second quarter crippled the equity underwriting division, which generated $239 million in the second quarter, a 37% drop from the prior year. Don't expect a major strategic shift into more traditional lending to high-net worth individuals, despite a Wall Street Journal article stating that Goldman is attempting to increase its lending to $100 billion this year. Viniar said there may have been some "overstatements" in reports of Goldman's move into this area. The bank, he said, has largely expanded its lending to customers in Europe, who have had trouble accessing dollar funding. Goldman Sachs is the fourth bank to report earnings, following JPMorgan Chase (JPM, Fortune 500), Wells Fargo (WFC, Fortune 500), and Citigroup (C, Fortune 500). Next up will be Bank of America (BAC, Fortune 500), which reports before the market opens Wednesday and Morgan Stanley (MS, Fortune 500) reports Thursday.